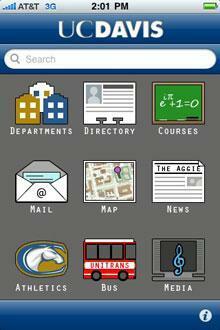 While taking an iPhone application course last fall, two computer engineering students, Sunny Dhillon and Fei Li, created UC Davis Mobile, a smartphone app designed for University of California Davis students and staff. Among other things, using the app, students and staff can access the school’s email portal, find out when their team is playing, read the school paper and check when the next Unitrans bus will arrive. According to Ken Joy, one of two professors who teach the iPhone application course on campus, the app has already been downloaded 2,000 times and plans to add more features are in the works this semester.